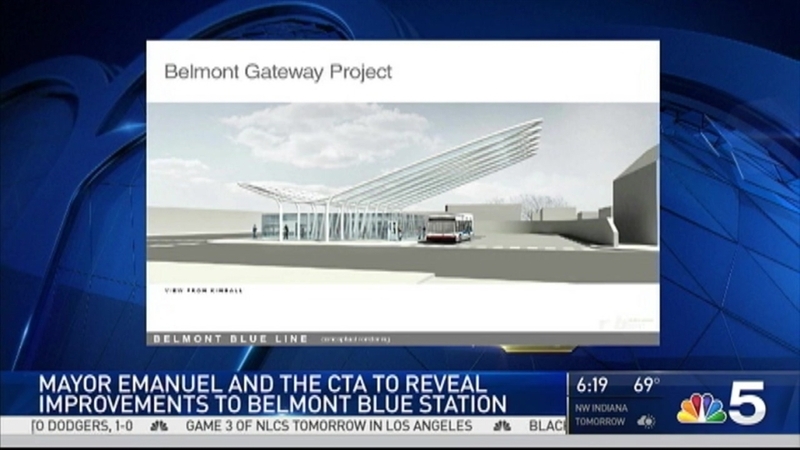 Nearly 50 years after being opened in 1970, the Chicago Transit Authority’s Blue Line Belmont station and bus terminal will be getting some much-needed improvements. Mayor Rahm Emanuel and CTA President Dorval R. Carter, Jr. announced a new renovation project Monday morning that aims to revitalize the Blue Line O’Hare branch's Belmont station while "infusing unique architecture" into the Northwest Side’s Avondale neighborhood. Under the "Your New Blue" project, the Belmont station will also be the first in the city to test a new prepaid boarding program that city officials hope will customer flow. “Projects like this bring notable architecture and design that celebrates and complements the character of our communities, enhance our neighborhoods and bring economic and cultural opportunities to residents and businesses,” Mayor Emanuel said in a statement. The Blue Line's Belmont stop is one of the busiest CTA stations in the city, with the sixth highest ridership. Transit officials say prepaid boarding will speed things along for bus and train commuters, which in turn enhances safety for passengers. "Sometimes we have to wait really long, so this is good because lots of people can just stay there whenever they need the bus or the train," CTA commuter Penelope Mora-Avila told NBC 5. Renderings of the planned changes include an extended canopy designed to give commuters more coverage during severe weather, as well as a sleek, modern design that replaces the current aging infrastructure. The project also includes streetscape and landscape improvements that will be combined with the station improvements to create a signature gateway to the Avondale community. The project, which is still in the design and development phase, according to the mayor’s office, is expected to cost up to $15 million. The CTA expects to begin the improvements in 2017 and take roughly a year to complete.